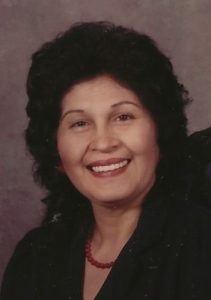 Eulalia Mares Salcedo passed away on December 1, 2018, in League City, Texas at the age of 87. Eulalia was born on December 14, 1930 in Los Fresnos, Texas to Hermenegildo and Francisca Mares. She was preceded in death by her Husband Jose G. “Pepe” Salcedo, parents Hermenegildo and Francisca Mares; Daughter Frances Garcia; brothers Eustaquio Mares, Geronimo Mares, Liborio Mares and a daughter-in-law Alicia Mata. She is survived her daughters Mary Cuevas of League City, TX, Sylvia Mata of Bayview, TX; her sons Bacilio Mata of Austin, TX, Armando Mata of Bayview, TX, Jorge and Jolynn (spouse) Mata of Maryland, Felipe and Sandy (spouse) Mata of League City, TX, Rolando Mata of Bayview, TX, and Mario Salcedo of League City; her sisters Eloisa Alvarado and (spouse) Carlos of East Chicago, Indiana and Maria Nunez of East Chicago; 14 grandchildren and 28 great-grandchildren. The pallbearers are Eric Mata, Marcus Mata, Mario Salcedo, Jr., Peter Garcia, Austin Mata, Evan Garcia and B.J. Dhillon. There will be a visitation on Wednesday, December 5, 2018 at Crowder Funeral Home in League City, TX from 5:00 pm to 9:00 pm, and a funeral service held at Crowder Funeral Home in League City beginning on Thursday, December 6, 2018 at 10:00 am with an interment following at Forest Park East Cemetery in League City, TX. My deepest sympathies on your loss. She was a lovely lady. May you find peace. You will be missed. Thank you for all the fun times and memories and how you treated me like a daughter. MY SINCERE condolences to the Salcedo Family, relatives and friends for the loss of your loved one, my first cousin Eulalia Mares Salcedo. She is in the warm loving hands of Our Lord Jesus Christ the Son of God feeling no pain or discomfort. WE have one more Angel in Heaven we can turn to for help to intercede on our behalf with Our Lord Jesus Christ the Son of God. God willing, I will see you soon upon my arrival in League City.